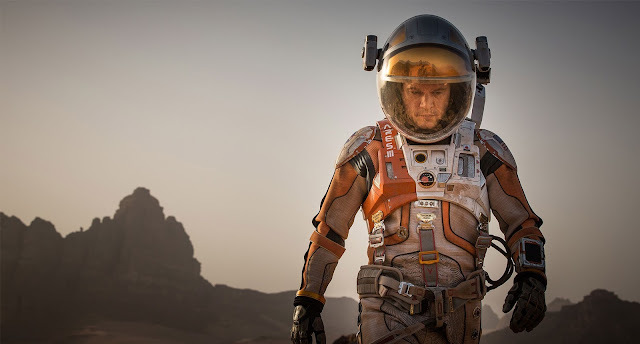 Mark Watney (Matt Damon) is a very smart man in a very bad situation. A member of a manned mission to Mars, he was struck by a piece of debris during a storm which separated him from the rest of his crew. Believing that Watney had been killed, and faced with the agonising choice between leaving him or being stranded themselves, his crew left and started their long, mournful journey back to Earth. Fortunately, Watney survived. Unfortunately, he's alone on Mars with limited supplies, no way of contacting his crew or NASA, and no means of escape. Faced with the prospect of a long stay on a dead planet, with eventual starvation the most likely outcome, Watney would be forgiven for giving in to despair. Instead, he becomes a regular Robinson Crusoe on Mars (though not the actual Robinson Crusoe on Mars) and uses the tools at hand and his scientific know-how to try and survive, no matter how much the odds are stacked against him. Life has become an increasingly cheap commodity in modern blockbusters. Thousands, if not millions, of unseen people are routinely slaughtered by monsters and super beings who wage war over their cities, with even conscientious efforts like Avengers: Age of Ultron and Pacific Rim (i.e. the ones that take the time to show their heroes trying to stop people from dying en masse) depicting extinction level events as pretty much de rigueur. Even Superman doesn't seem that bothered about saving people these days. The ability to create, not to mention destroy, whole worlds using computers has made disaster all too common, with little humanity amidst the destruction to make all those deaths mean much of anything. In stark contrast to that trend, and also to his recent work, Ridley Scott's The Martian is a remarkably positive and upbeat ode to the versatility of duct tape (and science, the triumph of the human spirit, yadda yadda yadda). Coming three years after Prometheus, which was predicated on the idea of humanity meeting God and discovering that he hates us, and two years after the laughable nihilism of The Counselor, The Martian shows an unwavering belief in the ability of people to rise to the occasion, even when that occasion is a bleak one. Watney stares down a seemingly insurmountable problem - he's stuck on Mars with no clear idea of how to escape - and breaks it down into a series of more manageable ones. He has to keep his habitat in working order so he doesn't find himself suffocating without oxygen, figure out how to produce food to supplement the rations his crew left behind, and work out how to contact NASA. By doing so, he staves off despair through pragmatism, while Ridley Scott manages to turn the farming of potatoes into one of the most triumphant moments in recent memory. The need to turn everything about this unexpected vacation into a problem that has to be solved lends the script, adapted by Drew Goddard from the novel by Andy Weir, a rock-solid structure and a small but tangible sense of progress to Watney's epic journey. Mixing refreshingly technical logic puzzles with sarcastic asides (charmingly delivered by Damon, who relishes the chance to be a smart aleck) and the occasional use of on-the-nose disco cues, the scenes on Mars do have a sense of adventure to them, one which is punctured by a disaster whenever Watney - or the audience - become a little too complacent. Unlike Gravity or Interstellar, The Martian is happy to show that space travel can be fun, rather than unendingly stressful or portentous, even as it reaffirms that it is unfathomably dangerous. But The Martian is not, despite the singular noun in its title, about one person. Scott's film splits its time between Mars and Earth, with the occasional check-in on Watney's crew on their ship The Hermes. While NASA, led by Teddy Sanders (Jeff Daniels) initially believe that Watney has died, they immediately spring to action and start trying to figure out how to get him home once they discover that reports of his demise have been greatly exaggerated. Engineers, bureaucrats and mathematicians, played by the likes of Chiwetel Ejiofor, Kristen Wiig and Donald Glover (who gets The Martian's equivalent of the Star Trek moment where someone explains a complicated idea in very simple terms) set their minds towards saving the life of one man, regardless of the risks and the cost. Similarly, the crew of The Hermes, once they learn that Watney is still alive, immediately think of ways that they could help, even though their best case scenario would be spending literally years longer in space than they expected. There's a real sense of camaraderie and community between all of the characters, even though most never share screen time because there are millions of miles between them. Even as it puts Watney through the ringer by impaling him, blowing him up, and gradually emaciating him, The Martian remains an unfailingly optimistic film about the potential for people (and not just individuals, but organizations and governments) to achieve great things once they focus their energies on a goal. It's a slightly corny message, admittedly, but it's wrapped up in an alluringly sleek and exhilarating package. The only major fumble on the part of Scott and his team comes in the final third. In order to effect an escape, Watney has to travel a huge distance in order to make a rendezvous and, in one of the bigger departures from the novel, that journey goes off without a hitch, whereas in Weir's book it is beset by disaster after disaster. The sudden lack of incidents in a story otherwise packed with them ultimately pays off since it makes for a pleasant lull before a tense finale, but it also results in the film shifting gears from being a funny, taut tale of survival to an extended montage of (admittedly stunning) Martian landscapes and Earthbound engineering. When a film provides almost non-stop excitement for more than two hours, even a brief slowdown feels like a screeching halt. For Ridley Scott's best film in at least a decade, being merely good for ten minutes or so feels like a misstep, even though he's been struggling to achieve even that quality for years. The creative rebound represented by The Martian might be an even more unlikely outcome than Mark Watney making it home.